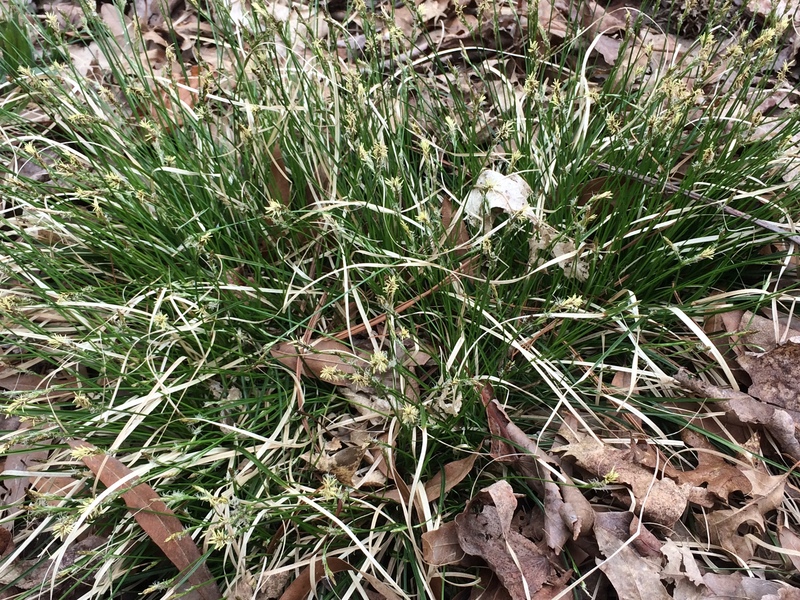 Carex pensylvanica plant in bloom with old and new leaves. MBGargiullo. 4/2017. Central NJ. 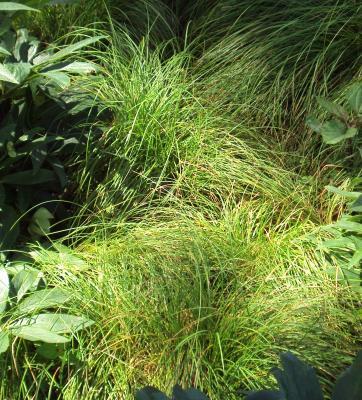 Carex pensylvanica is a perennial sedge to 50 cm tall (usually less), tufted and extensively colonial from scaly rhizomes or stolons, wintergreen (Brewer 1980), leafy tufts reddish at base and with persistent fibers from old leaves. Carex pensylvanica plants not in bloom. www.thebattery.org (Accessed 12/2014). Leaves fine, 0.1-0.3 cm wide, usually shorter than fertile stems in tall plants. Flower stems about 30 cm, sharply 3-angled; male spikes terminal about 1.5 cm, club-shaped, widest above, reddish to whitish-brown, female spikes 1-4, stalkless to short-stalked, rather close together, rounded, about 0.7 cm long, near top of stem, the lowest sometimes with leafy bract, scales of perigynia reddish-purple to brown, about as long as perigynia, perigynia rounded, thin, hairy; blooms March-May. 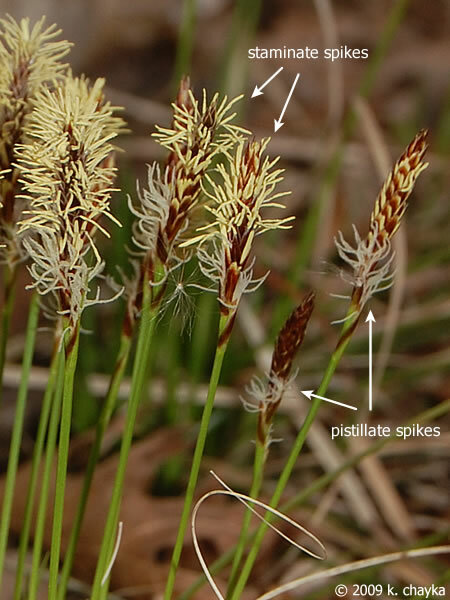 Carex pensylvanica inflorescences labeled. © 2009 K. Chayka. www.minnesotawildflowers.info (Accessed 12/2014). Habitat: Upland oak or mixed deciduous woods, tolerant of open shade and dry, sandy soil. Found in soil pH 5.0 (Gargiullo unpublished data). Notes: Also used extensively in woodland restorations. Seeds eaten by many birds and small mammals, plants eaten by some mammals, roots eaten by moles (Martin et al. 1951). Fed upon by some grasshoppers (Hilty 2006).